In the previous pAsauram AzhwAr mentioned about the issue caused by the sensory organ eyes. In this pAsuram he mentions about how all the organs in his body are melting. உடலெனக் குருகு மாலோ எஞ்செய்கேனுலகத் தீரே. en seygEn – what will I do? kudadhisai etc – in two lines AzhwAr shows what is the entity that melted him. emperumAn had created bhUmi (earth) for enabling chEthanas who have done a mixture of puNya (virtues) and pApa (sins), thiryak (animals) and sthAvara (plants) who have done more pApa than puNya, to live. He created heaven for enabling dhEvas (celestial entities) who have done more puNya than pApa to live. AzhwAr thought all along that there was no purpose for the four directions east, west, north and south. Now he has realised the reason for creating these four directions. He has realised that the purpose of creating chEthanas is only to make them long for mOksham (liberation), the purpose of creating the worlds is to enable jIvAthmAs to live and the purpose of creating the directions is for keeping his divine head and divine feet so that the chEthanas get a taste for mOksham. kudadhisai mudiyai vaiththu – in order to benefit the western direction, he kept his divine head adorned with the crown that indicates that he is the Lord of both nithyavibhUthi (spiritual realm) and leelAvibhUthi (materialistic realm). Just as nammAzhwAr had called out in thiruvAimozhi 3.8.1 “mudiyAnE” – one with the divine crown, keeping his quality of being the Lord, he kept his divine head in the west direction so that those in the west direction would prosper. thendhisai ilangai nOkki – Until now, in each of the directions he kept one part of his dhivya thirumEni (divine physical body) in order to remove the purposelessness in those directions. He looked at the southern direction to remove the shortcoming in him. The others were the help that he rendered out of his mercy. This (looking in the southern direction) is the help that he rendered himself to overcome his powerless state. 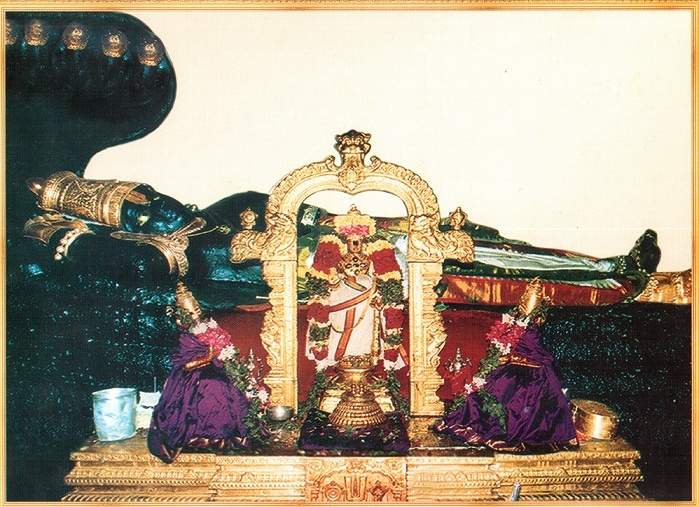 kulaSEkara AzhwAr in his perumAL thirumozhi 1.10 said “anbodu thendhisai nOkkippaLLikoLLum” – lying down, looking at the southern direction with affection. emperumAn looks at the southern direction which is the dwelling place of his protector vibhIshaNa. periyAzhwAr in his periyAzhwAr thirumozhi 4.9.2 says “mannudaiya vibIdaNarkA madhiLilangaith thisai nOkki malar kaN vaiththa ennudaiya thiruvarangaRku” – after removing the hurdles for vibhIshaNa, emperumAn gave the kingdom to him and lying at SrIrangam, he is looking at the way in which vibhIshaNa is ably ruling lankA. This is similar to how a mother who is nursing her infant, looks at the infant’s cheerful face. thirumangai AzhwAr said in periya thirumozhi 6.8.5 “selva vibIdaNaRku vERAga nallAnai” – emperumAn has special affection towards vibhIshaNa who was blessed by pirAtiti. When sugrIva threatened to walk out with his army of monkeys should SrI rAma accept vibhIshaNa, SrI rAma said “even if I have to forego you and your army, I will not let down vibhIshaNa”. This is similar to a cow, in order to protect its calf that it gave birth to that day, pushes aside the calf which is older, with its horns and hoofs. When that sugrIva did something which could have resulted in harm to him, SrI rAma said “thvayi kinchith samApannE kim kAryam sIthAyA mama I bharathEna mahAbhAhO! lakshmaNEna yavIyasA SathrugnEna cha Sathrugna! svaSarIrEna vA puna: II” – Oh, sugrIva with long arms! If something shameful had befallen you, what benefit would I get through sIthA or bharatha or lakshmaNa or Sathrugna? Oh warrior who kills enemies, what benefit would I get out of my own body? Such was rAma’s affection towards sugrIva. But his affection for vibhishaNa was greater than that which he had towards sugrIva and hence he is lying in SrIrangam, looking in the direction of vibhIshaNa. endhai – he displayed such a form and enslaved me. When a new well is ready, the old well is cleaned up for maintenance. When I have been enslaved by this form, there is no need to talk about his taking under control the nithyasUris, displaying this form. His form has enslaved someone like me who is totally under the control of body and senses and who is the epitome of all that is low. aravaNaith thuyilumA kaNdu – Just as a gemstone’s value goes many times higher after being fixed on a gold ornament, emperumAn’s form became incomparable after lying on AdhiSEsha. udal enakku urugumAlO – after seeing emperumAn’s thirumEni (divine physical form) lying on AdhiSEsha, instead of enjoying that, AzhwAr’s body is melting. rAmAnujar in SaraNAgathi gadhyam 12 says “bhagavath svarUpa thirOdhANakarIm” – the body hides the basic nature of bhagavAn. Such a body, which hides emperumAn’s svarUpam is now melting after seeing his divine form. brahma sUthram 3.2.5 says “dhEhayOgAdhvA sO’pi” – the reason for chEthana’s svarUpam being hidden is because of its connection with the( gross and subtle forms of) the body. Thus, the body which is supposed to hide the knowledge of AthmA, is not only enjoying the divine form of emperumAn but is melting as a result of that joy. When samsAris who came with AzhwAr to worship periya perumAL said that their bodies are not melting, AzhwAr responds enakku urugumAlO – see, it is melting for me. We shall now move on to the 20th pAsuram. This entry was posted in mudhalAyiram, thirumAlai on September 27, 2016 by T N Krishnan.